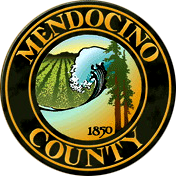 Note: This story originally appeared on the Fire Adapted Communities Learning Network blog. Subscribe to have more stories like this delivered to your inbox. 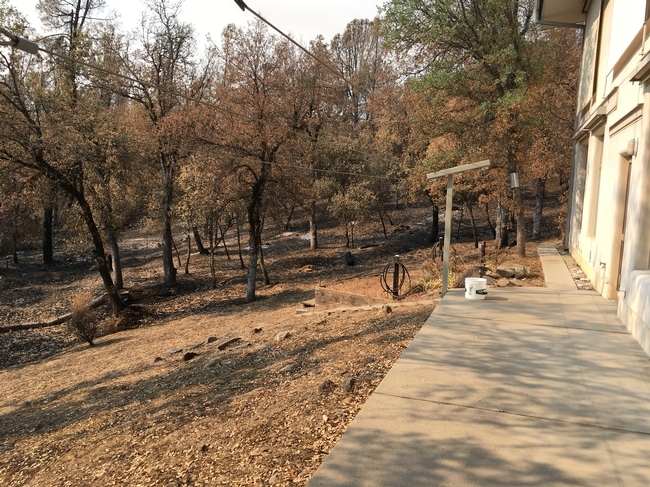 Randall Hauser knew that building in the Redding, California, area meant that his family's dream home, to be located in a blue oak and pine forest, would likely one day see a wildfire. Consequently, when they began construction in 1994, they kept fire in mind and paid close attention to the home's design and construction. Fast forward 24 years, to the Carr Fire. Over 1,500 structures were destroyed in that fire, 17 of which were Randall's neighbors' homes. But his remained standing, unharmed. What made the difference? Here are a few of my observations after visiting his home. The house includes a well-maintained, simple, “Class A” metal roof (PDF, 1.15MB). The house did not have dormers (i.e., small rooms that project from the roof) or other, more complex roof designs. I've seen several homes, that despite having metal roofs, did burn. In many of those instances, accumulated leaf litter in the gutters gave fire an entry point into the home. The Hausers incorporated and maintained a non-combustible zone (3–5 feet wide) around the outside of their home. There are cement and crushed-rock walkways adjacent to the house, and they regularly rake leaves and cut the dry grass. 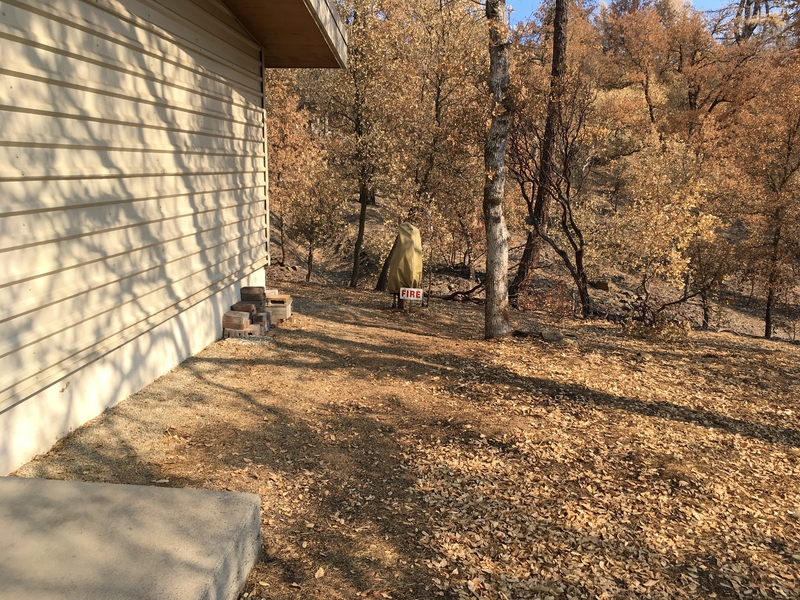 During the Carr Fire, this helped prevent an ember landing in vegetation adjacent to the house and bringing fire to the house. The landscaping closest to their home is well maintained. Tree limbs are pruned, and vegetation is open structured and includes low-growing cactus and succulents. They designed the house with boxed-in or soffited eaves with the venting located at the outside edge, making it more difficult for embers to enter the attic. Note: The latest research suggests that homeowners should replace ¼-inch attic and foundation vents with ⅛-inch mesh screen. Download the NFPA/IBHS fact sheet on vents (PDF, 1MB) to learn more. Their siding is well-maintained stucco, rather than horizontal plank siding with lap joints. Similar to metal roofs not being a guarantee for wildfire resilience, resilient siding is not as simple as stucco versus wood; a resilient home depends on the design, installation and maintenance over time. They provided water for firefighters, and their fire hoses are labeled with reflective signs. This made the water accessible to firefighters. Review the University of California's Home Survival in Wildfire-Prone Areas: Building Materials and Design or the Insurance Institute for Business and Home Safety's wildfire research archives for more information. While replacing the roof may not be in next year's budget for you, upgrading the venting and maintaining the vegetation around the house could be a good goal for 2019. Thank you, Randall, for showing us how to have a resilient, aesthetically pleasing and functional home in a fire-prone region.